I haven’t had paella in Spain, but if I ever hit up Valencia I know paella will be on my must eat list. Paella has bits of everything I love: rice, seafood, and most importantly, crispy burnt parts. Not everyone is into that toasted rice flavour, but I think the socarrat is the best part. If you want the all important burnt bits, or socarrat, you’re going to need a paella pan. Paella is a dish where the cooking vessel is crucial. The width of a paella pan helps with rice distribution, ensuring that the rice cooks in a thin layer. Paella pans are sized by width and not height. So a pan that feeds two is generally about 10-12 inches and a pan that serves eight is about 18 inches. The wider the pan, the more people it feeds. They even have pans that are 4 feet wide! Last Christmas Mike and I were in London and we saw two giant paella pans at Covent Garden. The saffron deliciousness wafting through the chilly air was so tempting so we decided to join the huge queue for a taste. I’m sure Hola Paella isn’t the most authentic paella in London, but it’s attracts a lot of attention and was a perfect snack to warm us up on a cold day. After our giant paella experience I vowed that I would make paella at home. For my first attempt I tried to use a cast iron skillet and risotto rice. Big mistake: while the rice was tasty, it was more like a strange rice pilaff risotto and nothing like paella. This time around I armed myself with the right ingredients and the right cookware. Just as important as the paella pan is the rice. Paella should be made with Calasparra or Bomba rice, medium grain rices grown in Spain. Spanish rice is chubby and round. It’s shape makes it ideal for absorbing large amounts of liquid while still staying somewhat firm. In traditional paellas, the rice kernels stay separate – in no way are they creamy or mushy. The rice really is the best part of a paella. I can eat loads and loads of that smoky, saffron flavoured rice and I have. I made a giant pan of paella for Mike, myself and a good friend thinking there would definitely be leftovers (the recipe says serves 6-8), but the three of use polished it off in one sitting. We totally fell into simultaneous food comas afterwards, but it was oh so worth it. i am saffron-y, i am crispy rice bits: i am paella! 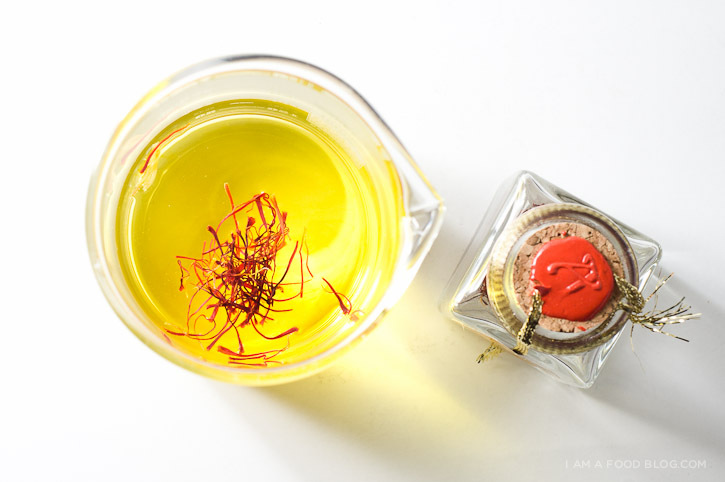 Put saffron and 1⁄4 cup hot water in a small bowl; let sit for 15 minutes. Season chicken and shrimp with salt and pepper. Heat oil in a 16″–18″ paella pan over medium-high heat. Add chicken, shrimp, and chorizo and cook, turning occasionally, until browned, about 5 minutes. 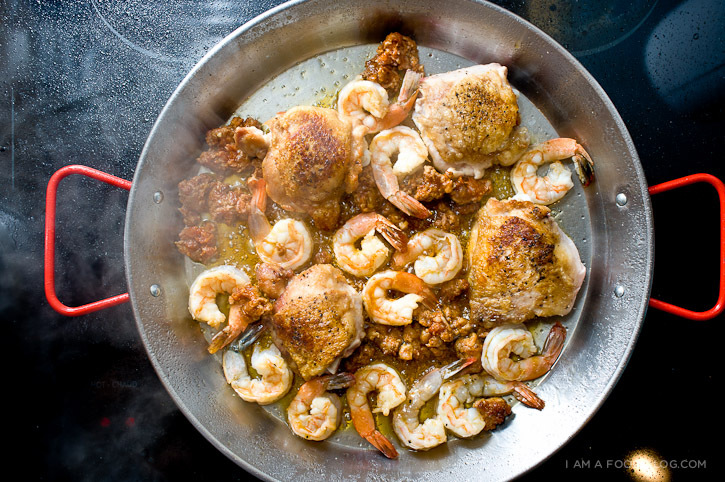 Transfer shrimp to a plate, leaving meats in pan. Add paprika, garlic, tomatoes, and onions to pan and cook, stirring often, until onions soften, about 6 minutes. Add reserved saffron mixture and broth, season with salt, and bring to a boil over high heat. Sprinkle in rice, distribute evenly with a spoon, and add peppers. Cook, without stirring, until rice has absorbed most of the liquid, 12-15 minutes. (If your pan is larger than the burner, rotate it every two minutes so different parts are over the heat and the rice cooks evenly.) Reduce heat to low, add reserved shrimp, and nestle in clams hinge side down; cook, without stirring, until clams have opened and rice has absorbed the liquid and is al dente, 5–10 minutes more. Turn heat to high for 1-2 minutes to create the socarrat. Remove pan from heat, cover with aluminum foil, and let sit for 5 minutes before enjoying. 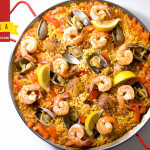 **Paella is totally customizable so feel free to make this dish vegetarian, all seafood, or all meats. I have only somewhat been interested in Paella, but after reading this post, I’m definitely going to try it! Thanks! I haven’t made this in a while, and have made it with only seafood in the past, will definitely try with chicken and chorizo! Love that photo of the saffron! I love your blog. So I hope don’t upset you with my comment. But chorizo in a paella is prophanaty. 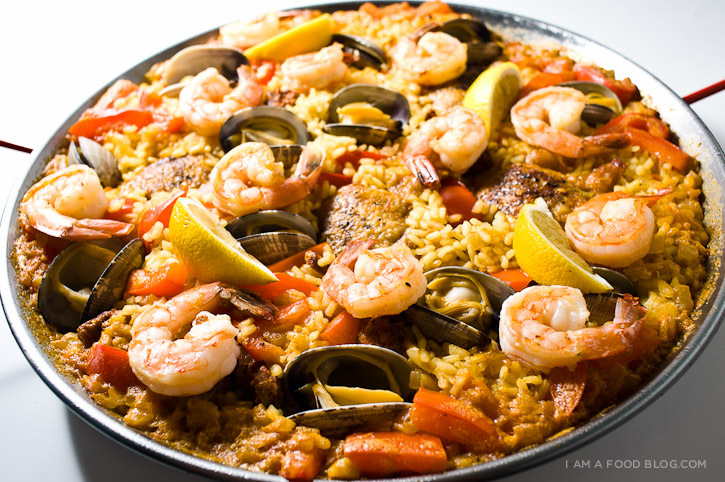 Paella can be made with chicken and rabbit or with seafood, never together. And vegetables! All paellas should have vegetables. Sorry in Valencia, paella is our big dish, and this is rice with things, I’m sure it was delicious, but it’s rice with things. Please! 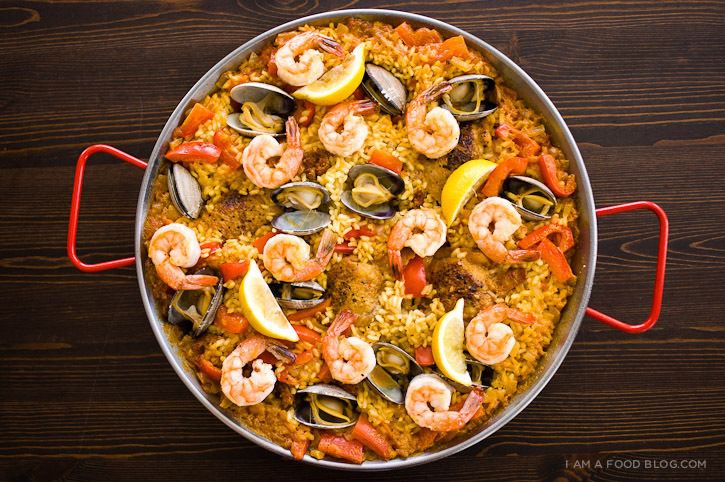 Paella varies from region to region and Valencia does not have the monopoly on paella nor how it should be made – my Mom who was from Fernancaballero made it with pork,chicken, shrimp, mussels and calamares when times were good! Less if times were tight. And paella with chorizo is absoultely wonderful!!! I personally make it with tomate frito, chicken breast, pork, shrimp and chorizo and instead of chicken broth use seafood broth. For my vegetable I use peas but green beans are tasty too. So to call any dish that doesn’t fall into your narrow scope of experience as “rice with things” is a little insulting. Well said Julie, to call any dish that doesn’t fall into your narrow scope of experience as “rice with things” is a little insulting. My father would make it with chicken, shrimp, lobster, chorizo, and would at times throw in fish. My grandfather who was a spaniard loved it. hehehe I agree with your comment. And yes, vegetables are really important in any rice! That’s bull. I read a response on another paella review that used chorizo. The person said they had just come back from a 2-week trip to Spain, had paella at 6 different places spread all over the country including in the house of a local family, and that every single one used chorizo. I too get tired of people who insist that a dish is not “authentic” just because it is not done a certain way. Especially irritating are complaints that it is not authentic when the chef never even claimed it was authentic! Every August we make one very like this at our friends’ cottage on Plymouth Long Beach, except we supplement the shellfish with a lobster! The lobster adds a great splash of color in the middle of that big pan. Maybe it’s not authentically Spanish, but if you want fresh and local fish for the dish, lobster’s what we’ve got! My father was from Valencia and my mother from Alicante. Our family have cooked and eaten many paella’s. The beauty of this dish is that you make it with what’s regionally available and what you like. We always had it with chicken, pork, clams, mussels, shrimp, fresh string beans or peas and chick peas. It’s best made outdoors on an open fire to incorporate that “smokey” flavor. My children and their friends love to watch it being made (and eating it!) it is a very “social” meal. Makes for great memories. A very festive meal, this is. Even the color is really enticing. I would love to try sometime but the complexity gives me the hesitations. You have presented the recipe however in so easy a manner that I am inspired to try this really soon…Thanks! Anyways, your phenomenal photos have caught our attention, we have been in the lookout for unique and interesting bloggers since we have launched our food photo gallery http://www.yumgoggle.com/gallery/ This will allow you to showcase all your great work and share it with our visitors. We’d be proud to have your work as part of our growing collection to continue to have a larger reach and further inspire all fellow food lovers out there! I’ve never made paella, but that clearly must change! I totally want to make a big batch and eat it all week for lunch. I love your blog and as usual it is a deliciously fun article. NEVER add chorizo to a paella. That’s not even Spanish. The referenced saveur.com recipe calls for the correct style of chorizo but the blog’s author (mistakenly IMO) switched to Mexican chorizo. I made the same mistake in my first paella, it was kind of a disaster. Sliced andouille or other cajun style sausage is a tasty and cheaper substitute for spanish chorizo. Ouch that giant paella is killing me. Thank you for your ‘how to choose the proper pan’ to cook this type of food. It’s really helpful. I am sure you have heard by now but in the true Valencia fashion – newspaper is added as the top (after the whole dish has come to a good rolling boil) heat is reduced (fire burned down at the exact appropriate time; even building the fire is an art! Should I have the lid on while the rice is absorbing the broth? everyone will have their own versions! If you blog to criticize…..you are missing the point!!!!!!!!!!! sorry replied to the wrong question. can you make an aioli please to go with the paella! I love to eat and I can see no reason to not love paella! 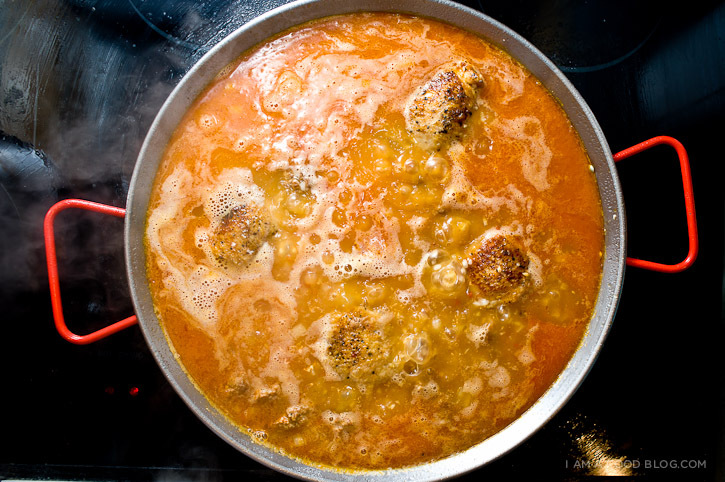 Please share a resource for us non-Valencians to understand how to make an authentic paella. I used to work at a restaurant that made the best Paella ever! I haven’t had the courage to make it on my own but might just have to give this recipe a try. I’d love to ramp up the spiciness of this dish…any suggestions? Oh the Valencian paella is the best!! I love your pictures. You’re a very talented food stylist, cook, writer, and food photographer. I’m a fellow blogger who’s trying to learn how to take better food photographs as my photos are really bad. I was wondering if you also teach for a fee via email or in person. I was looking for a recipe for Paella. I’ve found it. And i found a great food blog. thanks. Wow, great blog and photography. What’s going on with the hiatus though? Ooooohhh, this looks delicious and the photos are fantastic, great job! I’ve stumbled on this page about trends in food and various market research related to the topic: http://www.researchspy.com/ Food sites are my favourite place to go on the web! could you let me be one of your dinner member? This is a great blog. Recipes found here makes me wanna start cooking. Btw, Filipinos make the best paellas in Asia! I love Paella! Fantastic recipe! Thanks. Love these yummy recipes! I look forward to more! Thank you for the wonderful recipe! I cooked paella for my girlfriend and son tonight for a special Valentines dinner. I added scallops, carrots and greenbeans to your recipe. I grew up with a Hawaiian grandfather who loved to make paella and he always added the carrots and greenbeans. I am just now coming out of the food coma, and the family loved it. I’m looking forward of cooking this dish in my kitchen. I made the Mixed Paella and my goodness was it delicious. I highly recommend this recipe. The recipe produced food as good looking as the photographs! I like to eat paella food, paella food generally made in simple rice but i like mixed paella or rice ,sea food, meat and vegetable. I am Spanish (since I was born!) and I’ve only seen using chorizo in Paella here in London. Original Paella does NOT include chorizo. Come on, think about it. We’re using fresh ingredients, fresh fish, expensive saffron… Why to mask the gorgeousness of these ingredients with the flavour of chorizo? I spent part of my childhood in Madrid and paella was a favorite. Our maid made paella with chicken, pork, chorizo and snails. It was what she made for the kids when the parents were entertaining and serving steak. Lucky us!!! When we moved back to the states we substituted clams and shrimp for the snails. Valencia does not have the market on the only paella. It truly depends on the region and what is available. I grow saffron in my garden now because I love paella and I use saffron in many other dishes as well. This is yummy! Going to try this! Looks delicious,Thanks a lot for this recipe. I think this is a really good blog, but I agree, I am half Valencian-half Londoner and this rice dish traditionally started by adding what was available for the rice field workers at the time. So you can interpret this as freely as you like. But, if you wish to make a good quality Paella and true to the original one, then you must not add many of the ingredients above and specially not chorizo. My reason for this isn’t only to keep the authenticity, but also because of the greasiness that chorizo will instantly add to the rice, avoiding it from cooking to perfection and never the less the strong flavour that indeed masquerades the dish. I feel the same with the sort of chicken you might use, if you use breast it will become vey dry and therefore not appealing and the same for prawns, if you add them already peeled, they will become dry and tasteless. I understand many people do this for the comfort of not peeling them or because they find them repulsive but just ruins the prawns. Anyway, enough with my opinion, I managed to bore myself here. I feel other sorts of rice with other ingredients are either, arroces al horno, or may as well be called Spanish rices. Am I supposed to cover the pan after I put the rice in and cook it without stirring for 12-15 minutes? What about when I reduce the heat to low and add the seafood? Very brave of you to try the variations. We use chicken thighs, Portugese chorizo and shrimp. Try shelling the shrimp and adding them 5-7 minutes before the finish of the dish. Just tuck them down in the rice and they will take care of themselves. Personally, I prefer the Portugese chorizo also. It is made slightly differently from the Spanish and I think it less greasy … maybe that was just the brand tho. Anyway, you can put ANYTHING in a paella. My favorite is artichokes. Get the raw artichokes, cut them in fourths. at the V you’ll see the start of the little thistles. Cut diagonally thru the choke and what is left is pretty much edible. Treat the choke as a meat, that is, brown it after you’ve browned the pork and/or chicken. Add the chokes back in when you put in the rice. Also, about the “minced tomatoes”? If you’re going to use American commercial tomatoes, you should probably use canned, CRUSHED tomatoes. They taste better, no seeds and are a pot load easier. 1.5 cups of crushed tomatoes is about 3 large tomatoes. AARRGGHH! I was about to begin this dish using a 16″ cast iron skillet. Pretty sure I may need to add one more important item before I begin, a proper Paella pan. Thanks the good advice, and for you beautifully styled, photographed & presented material. A++! Wow the presentation is very attractive and most of the ingredients are not hard to find. But I was thinking what will I substitute for the saffron to make the dish as tasty as yours. I will definitely try your recipe if I’m ready. Thanks! I am food lover person. Fantastic recipe!. I am going to make this today in my home. Love paella and I’m chuckling a bit at the “things” comment as I like a fatty pork sausage (kielbasa) in my paella…the pork plays well with the seafood and the chicken. What’s up, after reading this remarkable post i am too glad to share my experience here with colleagues. We lived in Spain for 12 years and had plenty of paella meals with friends. Your’s looks beautiful and delicious! –like a Spanish mom whipped it up! Why wasn’t all of the rice cooked evenly in my paella? It took a lot longer than the recipe said, I had to add extra broth but still had about 5 % not fully cooked…. What should I do next time? Is your pan a lot bigger than your burner? It may be due to uneven heat. I don’t want to disappoint your followers, but the official paella is not with sea food, is not with chorizo and is not with chicken. In theory the authentic paella is only with rabbit. But, whatever, who cares about the official! Actually the important thing about paella is the process of cocking the rice. And your is perfect! and, by the way, an interesting mix putting chorizo inside. I will try it! Looks great!!! I’m making it now! !I’m using leftover shrimp from last night’s dinner. Also chicken,mussels, chorizo, smells amazing!! If you’re keen on trying something different, this is what i do for a seafood paella. When I buy the prawns, I buy them with the head on. I save the peel & head of the prawns and I boil them to make a broth. I use that broth (instead of chicken broth) and it has a wonderful seafood flavor to it. Enjoy! I haven’t tried this recipe yet, but it look very good! I’m always interested in cooking new things, and I LOVE seafood! This is one of my favorite all-time dishes. The saffron makes all the difference. 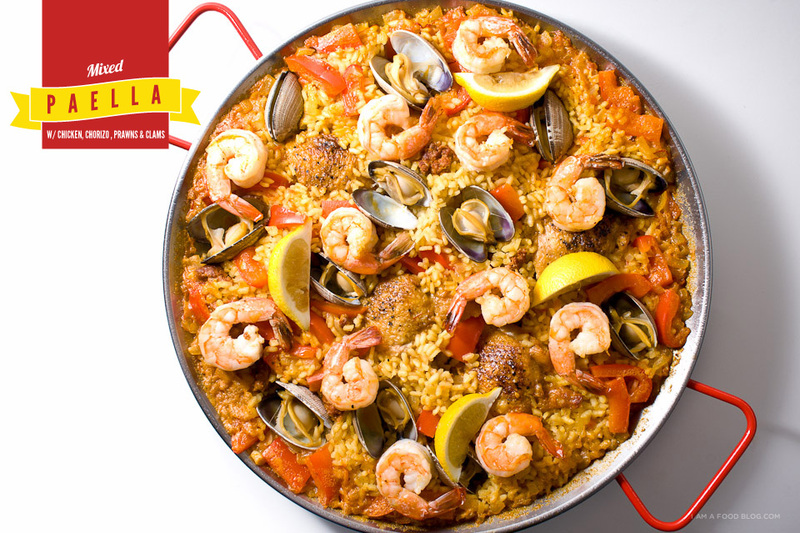 Did you know that in Madrid, there’s a street lined up with paella restaurants from different regions of Spain. The locals call it paella alley. Ok I am crazy about paella and looking at this I am starving just after having an enormous dinner!! I was in Barcelona over New Year’s Eve and was thoroughly disappointed with my paella experiences. Then I decided to give it one last try close to the coast, and oh my God – it was the tastiest paella I had ever had (and I have a Spanish mother-in-law who makes a pretty good Paella). Wow!!! this dish looks really great. Never mind about the postings of people who say it is not made with this or that. 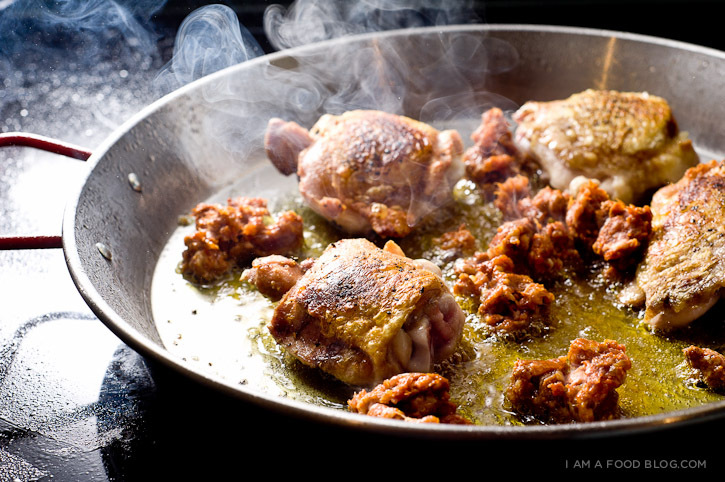 This dish has always been dictated of the area you came from in the old days of Spain. If you lived in the Mountains your dish was dictated with more live stock and bird type meats, more on flat lands it was meats and veggies, close to water it was more seafood, as time evolved and greater access to different produce people started doing mixtures with anything that walks, crawls, fly’s or swim and grows like vegetables. Cooking is all about trying new things and challenging your pallet. I have tested Paella dishes in many forms including the authentic and have loved them all. Keep up the good work and keep posting. You have just inspired me to start my own blog and share some of my favorite dishes. Don’t worry about the haters, people are sometimes afraid of change or to venture outside of there comfort zones. Oh and btw beautiful pics. this was amazing and the recipe was very easy to follow. we ate it literally in 2 sittings, one right after the other. i really want to print it out, but don’t see a link or way to do that? thanks! Hi! This looks delicious. I’m trying to figure out how much time this takes to prepare and cook from start to finish? Anyone who has made this before have an idea? i say it would take about 1 1/2, depending on how quickly you are able to prepare the ingredients. the total cooking time is about 45 minutes to an hour. hope that helps! I intend to cheerfully cook and eat rice with ALL THE THINGS then. This looks delicious and coincidentally lines up closely with paella I had in Madrid. Spain. Yes, I’ve had restaurant paella in Spain and chorizo was involved. This turned out to be really, really good. I didn’t have fresh peppers, so subbed in roasted peppers. I didn’t have chorizo and subbed mild Italian sausage, but threw in some red pepper flakes. Lastly, I added whole cooked shrimp and it still turned out to be fabulous! I have made paella for many years, using a 15″ pan. How do I convert recipes from a 15″ to a 10″ pan? Thank you. reduce all the ingredients by 1/3. The debate about what ingredients should or shouldn’t be in paella will likely go on for generations. But keep in mind that originally, paella was made with water vole, and we don’t see a lot of people arguing for that in the “traditional” version of the dish. Paella Valenciana is delicious and should be respected, but there has to be room on the table (pun intended) for new innovations, too! I believe people are getting upset over the term chorizo. In spain Chorizo is usually sliced like a sausage and not the same as the chorizo we see in the US. And I agree I’ve had chorizo in paella in spain and all regions make paella with different meats and fish.